The Seahawks may still consider bringing in Kaepernick for a visit as the team explores options at backup quarterback but needs assurances that he is committed to football. The Seahawks were ready to bring in former 49ers quarterback Colin Kaepernick for a workout Monday as they search for a backup to Russell Wilson but postponed the meeting when he said he did not know what his plan is for his off-field social activism going forward, including whether he would continue to kneel for the national anthem. The news was first reported Thursday by ESPN’s Adam Schefter and later confirmed by the Times. A source told the Times that the Seahawks asked Kaepernick what his plans would be for his off-field activities if he were to play football in 2018 and that Kaepernick — who kneeled for the anthem during his most recent season in the NFL with the 49ers in 2016 — said he didn’t know. The Seahawks were said to want a firmer plan from Kaepernick about all of his off-field activities — including but not solely limited to kneeling for the anthem — and how that might impact football. The Seahawks reportedly made the request of Kaepernick late last week after initially setting up the visit with Kaepernick roughly two weeks ago. With Kaepernick saying he was unclear of his future off-field plans, the Seahawks then decided to postpone the trip for now so that coach Pete Carroll and general manager John Schneider could further discuss the situation, but left the door open that Kaepernick could still be considered and brought in for a visit. However, several national reports — including ESPN and Pro Football Talk — stated that the workout was postponed solely because Kaepernick said he would not commit to standing for the anthem. That led to a perception that Kaepernick’s side was offering one version of what happened — that the visit was postponed solely because he would not commit to not kneeling for the anthem — while the team was offering a version that kneeling for the anthem was only one aspect of the equation. Regardless, what is clear is that the Seahawks had a definite plan to talk to Kaepernick about being the team’s backup and that now it’s unclear if any further conversation will happen. ESPN reported the Seahawks made arrangements for the visit with Kaepernick the day before Kapernick sat for his deposition administered by NFL attorneys in New York regarding the league’s alleged attempts to conspire to keep him out of the league. Seahawks owner Paul Allen is among those who is still scheduled to be deposed in the hearings, according to Yahoo.com. Regardless of what happens with Kaepernick, the Seahawks will are expected to continue to pursue other options at backup quarterback, as well — Seattle has only Wilson on its roster at quarterback after releasing Trevone Boykin last month after he was arrested in Texas on suspicion of domestic violence. Seattle also brought in Kaepernick for a visit last May after which Carroll said the team did not sign him due in part because “he’s a starter in this league and I can’t imagine — we have a starter. But he’s a starter in this league and I can’t imagine somebody won’t give him a chance to play.’’ Seattle eventually signed Austin Davis as its backup in 2017. Davis, who played just five snaps last season, remains a free agent. Under Carroll, the Seahawks have been regarded as being as supportive of players’ social stances and on- and off-field activities as any team in the NFL. Carroll publicly supported the decision of Michael Bennett to sit for the anthem last season (with Bennett often joined by most of the rest of the defensive line). Carroll also supported the team’s decision to stay in the locker room for the anthem before a game at Tennessee when the players wanted to make a statement following tweets and statements from President Donald Trump criticizing players who did not stand for the anthem. But Carroll also said at the end of last season that he thought some of the off-field activities took a toll on the team’s performance on the field, especially the 33-27 loss at Tennessee following a day of meetings to discuss what the team should do in reaction to Trump’s comments, and seemed to hint that he hoped the team would be more focused on football in 2018. Since then, the team has traded Bennett to Philadelphia. “You know, I think it had an effect in the game that week in Tennessee, yeah I really do think it had an effect,” Carroll said in his season-ending press conference on Jan. 2. “I think it had an effect on a lot of teams and a lot of players. It was an extraordinarily heated time. I think that was a different amount of emotional output that occurred before the game. It looked like it the way we played; it looked like it took its toll, and we had gone through the whole process in doing what we did. We needed to do it, and we couldn’t avoid it. We had to face it and we had to deal with it, and the other team called us up and said ‘What are you guys going to do,’ and they said ‘Ok, we’ll do that, too.’ I don’t know if they went through the same process that we went through or not, I don’t know, but I know we did. Honestly, if I could’ve done something about it I would’ve. I don’t think that there was anything but needing to face it; it’s too real. Kaepernick did not play in 2017 after spending the 2011-16 seasons on the roster of the 49ers. He led San Francisco to the Super Bowl following the 2012 season and then to the NFC title game following the 2013 season when the Seahawks beat San Francisco 23-17 at CenturyLink Field when Richard Sherman tipped a Kaepernick pass into the hands of Malcolm Smith for a game-clinching interception in the final seconds. The visit with Seattle last May is the only reported visit Kaepernick has had with an NFL team since he opted out of his contract in March, 2017, a move he made knowing the team was going to release him, which allowed him to hit free agency earlier. 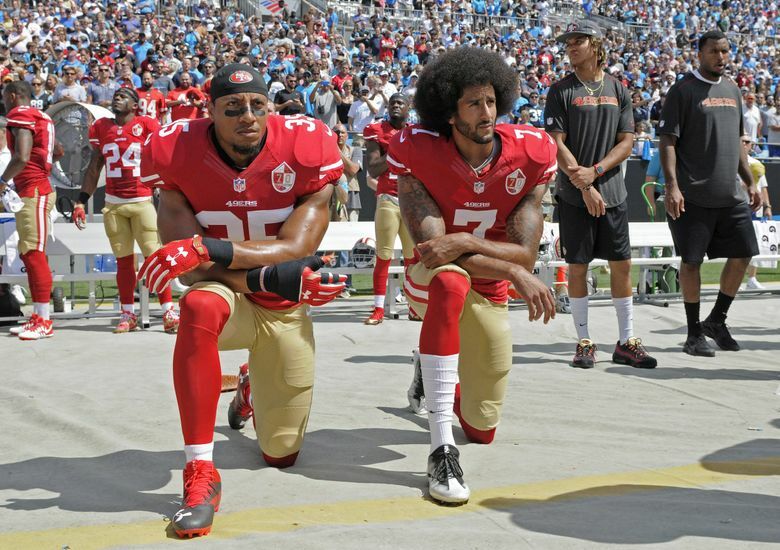 Kaepernick began kneeling for the anthem during the preseason in 2016 and continued through the regular season saying he wanted to bring attention to police brutality and other social injustice. The 30-year-old is 28-30 in his career as a starter.